Several online jihadists suggested Islamists were behind the deadly shooting at the Navy Yard as federal and local police investigated the motive behind the attack. U.S. officials said there were no immediate signs that terrorists were behind the attack at the Naval Sea Systems Command office. A total of 13 people, including the shooter Aaron Alexis, were killed and about a dozen others wounded at the Washington Navy Yard office located on a base in southeast Washington. The Navy Yard is located less than three miles from the White House. By late Monday, authorities ruled out two additional shooting suspects and now believe Alexis acted alone. Washington Mayor Vincent Gray told reporters that the investigation into the attack is ongoing and it is far too soon to draw any conclusions. "We don’t know what the motive is at this stage," Gray said, adding that the investigation is ongoing. "We don’t have any reason at this stage to suspect terrorism, but certainly it has not been ruled out." One U.S. official said intelligence agencies that monitor the Internet uncovered no immediate claims of responsibility for the attack from online Islamist terrorists. The FBI is said to be looking into whether the shooting was carried out by what are termed "homegrown violent extremists" or HVEs. The Boston Marathon bombing is believed to have been the work of two such radicalized Muslims. Several jihadists wrote in Arabic on Twitter shortly after the shooting began around 8:20 a.m. ET that it appeared to be motivated by Islamist extremism. Some used the hashtag "Al Qaeda" to report news of the shooting. Some jihadists said the shooting was part of global jihad but none indicated inside knowledge of the killings, suggesting the comments are probably speculation or propaganda. One Twitter jihadist said the attacks took place close to the 12th anniversary of the al Qaeda attacks on New York and Washington and thus appeared to be linked to Islamism. A jihadist named Idaat Amniyah (@abdallahsaker) who claimed to be part of the Middle East group Fatah al-Islam stated that the shooting showed "we have moved from the defensive to the offensive stage" of global jihad. Another jihadist, identified as Abu-Osama al-Muwahhid (@ab_osama1), issued a Tweet praising the attack and quoted al Qaeda leader Osama bin Laden as saying the United States would not have security because of the Israel-Palestine dispute. The posting said that the attack was the work of "not one lone wolf, but three." Still another jihadist commented incorrectly that news reports claimed the attackers were wearing a white garment called "al kafan" that is used as a death shroud, indicating they were on a suicide mission. D.C. Police Chief Cathy Lanier told reporters that in addition to the one gunman found dead at the Navy Yard building, intially two other suspects thought to be wearing military garb were being sought. One of the two suspects was ruled out and police continued a manhunt for the second suspect, who was spotted on security surveillance video. "This is still a very active law enforcement scene, " Lanier said at 4:00 pm. ET. Residents and businesses in the area of the shooting, which is located near the Washington Nationals baseball stadium, were asked to "shelter in place," she said. The Nationals game scheduled for Monday night was postponed until Tuesday. Lanier said authorities were close to determining whether the second shooting suspect was involved in the attack, or whether it was a lone gunman. The FBI identified the dead gunman as Alexis, 34, of Fort Worth, Texas. FBI Assistant Special Agent in Charge of the Washington office, Valerie Parlave, indicated that authorities know very little about the dead gunman and asked for the public’s help. 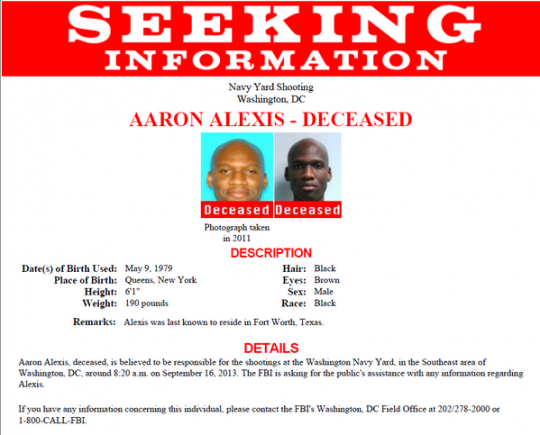 The FBI posted photos of Alexis on its website, FBI.gov. "No piece of information is too small, " she said. "We are looking to learn everything we can about his recent movements, his contacts and his associates." Lanier also said the FBI has taken over the investigation from local police and the Naval Criminal Investigative Service into the shooting, highlighted by dramatic television images of helicopters rescuing wounded Navy workers, some of whom were air-lifted off the roof of one building in the Navy complex. Asked for details on why authorities suspect there may be additional shooters at large, Lanier said: "We have multiple pieces of information that would suggest" there are additional armed suspects. DC Police have asked anyone with information about the shootings to call 800-225-5321. The FBI contact number is 202=278-2000 or 1-800-CALL-FBI. Lanier described the remaining suspect as a black man in his 40s with gray sideburns and wearing olive-colored military fatigues. An additional suspect, a white man wearing tan clothing, was later identified and cleared. Lanier said DC police arrived on the scene within seven minutes of when shots were reported fired, around 8:15 a.m. ET. Several "engagement units" of police exchanged gunfire with Alexis and eventually cornered him, she said, He was then shot and killed. Of the shooting scene, Lanier said, "it certainly was one of the worst things we’ve scene in Washington, DC as [police] officers." At the White House, President Barack Obama said he was briefed by aides on what he called "another mass shooting." "And today it happened on a military installation in our nation's capital," he said. "It's a shooting that targeted our military and civilian personnel. These are men and women who were going to work, doing their job protecting all of us. They're patriots, and they know the dangers of serving abroad, but today they faced the unimaginable violence that they wouldn't have expected here at home." "We send our thoughts and prayers to all at the Navy Yard who’ve been touched by this tragedy," he said.